In August 1999 during the Acadian reunions in Louisiana, I visited the Village Acadien south of Scott, and there I came upon the house of Senator Dudley LeBlanc. This brought back a lot of old memories. In 1966 the delegation of Acadians and Cajuns came for a visit to Belle-Isle en Mer, located off the shore of Brittany, France, to mark the 200th anniversary of the settlement of the deportees in the Island. We were all waiting in a silent crowd for the docking of the ferry boat "L'Acadie", all curious to see the cousins coming from the New World. As soon as they arrived, the token politicians and officials herded them their way. Three gentlemen, however, were showing their independence by taking their time and looking around on the dock. Two of them had white skimmer hats. As they passed in front of me, I asked them where they were from. "Abbeville, Louisiane," was the answer. The older gentleman then asked my name. "Michel Granger." I replied. They stopped in their tracks, and the same gentleman told me, "There are a lot of Grangers in Louisiana. I am your cousin Dud; this is my friend Monsieur Dugas, and this is my chauffeur, Mr. Baudoin." He then asked about me and my family, and I told him, "I am the eldest of eight children and my parents are second cousins from Locmaria. My father descends from Granger family #6 and my mother from Trahan family #35. 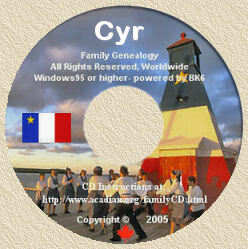 After the deportation the Acadian families got numbers on the island so that the government could trace them." I then showed them the photo of a short version of my family tree. Cousin Dud looked at it attentively, then said, "Michel, we are cousins on our mothers' side and on our fathers' side. Next he showed a large scroll of paper with all his family tree on it and said, "Look here and here." I agreed "Yes, yes." but couldn't make it out because I was 20 years old and at that age genealogy is not of great interest. Dudley said that in Louisiana people called him "Couzin Dud." He was a senator and an inventor, and the author of a book called, "The Acadian Miracle." He told me to go and see him at his hotel, and there he showed his sense of humor: two French women were showing off, saying that they had noble ancestry, unlike the islanders. He said, "My chauffeur, Mr. Baudoin here, also has some blue blood, he is related to the royal family of Belgium." (At the time the King of Belgium was Baudoin II.) Cousin Dud said that he was willing to arrange university bursaries for Acadian girls to go to USL. My sister Annie was the first one to go, and later some Acadian girls from Canada went to USL. Our family understands the connection that we have with Louisiana. In the past, for example, most of the Trahan family #35 moved to Louisiana, and only a few members stayed in Belle Isle. As a boy I read "The Blue Camellia" by Frances Parkinson Keyes because the Cajun customs that she described were the same as on Belle Isle, and we felt a sense of connection. In 1968, going from French Guyana on my way to Canada, I stopped in Baton Rouge to see Cousin Dud again, and he showed me the Capitol where he worked. By then we had learned more about our respective origins. For example, my father Robert Granger was chief customs collector in southern Morocco from 1948 to 1961, since he wrote to Louisiana at that time, Cousin Dud had received the impression that some Cadiens had emigrated to Morocco. After 1966 my father and Cousin Dud wrote and phoned each other. I will always see Cousin Dud as a pre-Renaissance man. He held the Acadian heritage together during the worst years, from the forced Anglicization of the First World War until the new dawn of the late 60s. During the same era, in Acadia and Quebec there were also such men who kept spirits up while the Acadians were surviving by withdrawing into themselves and rejecting outside influences. In Belle Isle en Mer such a man was Eusbe Portugal, a store owner. In 1966, apparently some Cadien visitors felt that they didn't see enough islanders, and some islanders felt that they didn't see enough Cadiens. That was because the over-optimistic organizers were mostly French outsiders. It took a while to understand the combinations and the divisions between parishes, families, and branches. Locmaria, one of the four communes of the island, is also a parish consisting of a burg (the centre) and thirty smaller villages. My mother's father was the mayor of Locmaria in the 20s, 30s and 40s, and as a young boy visiting villages, I was sometimes welcomed and sometimes ignored. In the burg of Locmaria all the businesses except for one restaurant belonged to one side or the other of my family. Not so long ago, whoever married outside the island was strongly advised to sell his property and stay away. My great-uncle David Granger was born in Locmaria, and because the family was large, he was designated to go to work as a boy while his brothers were sent to school-a fact which he resented. He became a sailor and was gone for years at a time. He said that he had met some Cadien cousins in Halifax as well as in New Orleans. He remembered Halifax for the great disaster of 1917, when the whole city was leveled by an explosion; he sailed into the harbour a few days afterward to pick up explosives. He remembered New Orleans because he couldn't ride in the same bus as a black friend; this took him aback. Despite his liberal views, he made sure that the family house didn't go to my father because the latter married a cousin, from what David Granger viewed as an enemy family in the same village. So when I went to Lafayette and learned that there were two Acadian villages, I felt quite at home. Although I am now a western Canadian, in 1976 I took a wife-to-be from the prairies to Locmaria to be married in the church. It is probably, as Zachary Richard says, "to save the heritage," and to keep in touch with the cousins- and Cousin Dud was surely one of them. I am very grateful to Michael Granger for having written and provided me authorization to reploduce the above-noted.